I got a new grill about a month ago now. After years of buying crappy box-store brand grills, I finally sprung for a top of the line grill and have learned so far that you definitely get what you pay for. During my search, I was back and forth about whether or not I really needed a rotisserie. I had never had a built-in rotisserie, so I really didn't know what I was missing. I finally opted for a model with a built-in rotisserie and dedicated infrared burner built into the back of the grill. After a month with my new rotisserie, I am now sad for all of the years I have wasted not having a convenient way to roast meat on a spit! In particular, I think of all of the leftover roast beef sandwiches I could have been eating at work. I used to think my grilled roast beef was the best ever, but it doesn't really hold a candle to this rotisserie roast beef. Once you try this method, the only purpose your roasting pan will serve will be to catch the drippings under the rotisserie roast for gravy. 1Mix together the rub ingredients and rub all over the rump roast. If you have another dry rub that you like for beef, go ahead and substitute, you won't hurt my feelings. Truth be told, it doesn't really need it but it feels funny to me not to rub it with something. 2Thread the roast beef onto the rotisserie, right down the middle and make sure you secure it with the forks so that the spit is locked into the rump roast. 3Configure your grill's rotisserie per the owner's manual. Another great thing about my new baby (grill) is that it has a built-in smoker box with a dedicated burner. I like to add smoke to the chamber while I am cooking the rotisserie roast beef. If you don't have a smoke box and want to add some more flavor, throw together a smoke pouch and get it smoldering before you put the rotisserie on the grill. 4Make sure you place a pan under the roast to catch those drippings! 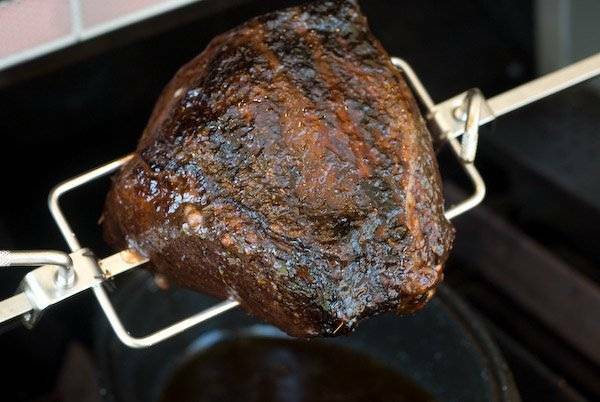 5Turn on the rotisserie motor and sit back while your rotisserie roast beef slowly roasts on the grill. This is so easy, right? 6After about an hour, check the internal temperature of your roast with a meat thermometer. I'm not even going to suggest a time because there are so many variables here. As a reference point, a 4.5 pound rump roast takes about an hour and a half on my rotisserie set up. 7Roast the rotisserie beef until you hit the desired doneness. I like mine medium-rare, so I roast the rump roast until 140 degrees. Remember that the roast will continue to cook for a little while once removed from the heat, so take it off about 5 degrees shy of your desired temperature. 8Remove the rotisserie roast beef from the grill, place on a platter and cover with aluminum foil to rest for about 15 minutes. 9While the roast is resting, make a rue using about 2 tablespoons of butter and about a tablespoon of flour (look for directions online if you haven't made gravy before). Stir in the roast beef drippings and beef brother as needed to make some awesome gravy! 10Carefully remove the rotisserie spit from the roast and slice thinly, against the grain, for maximum tenderness. A roux should be equal parts day and flour. Looks great! Great information! Thanks for the gravy idea- using it tonight! What is the temperature you are grilling at? 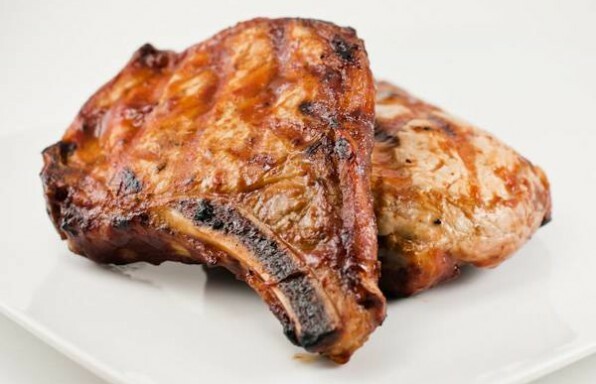 Do you grill over direct ot indirect heat? Can’t beat the caramelized layer a great rotisserie creates! Yum.